Manipulation of cotton canopy architecture offers the potential to maximize yield while minimizing inputs. Here we show that the major leaf shapes of cotton at the L-D1 locus are controlled by a Late Meristem Identity1-D1b (GhLMI1-D1b) gene which encodes a HD-Zip transcription factor. Okra leaf GhLMI1-D1b has a 133-bp tandem duplication in the promoter, correlated with elevated expression, while an 8-bp deletion in the third exon of normal leaf GhLMI1-D1b causes a frame-shifted and truncated coding sequence. Virus-induced gene silencing (VIGS) of GhLMI1-D1b in an okra variety was sufficient to induce normal leaf formation. An intermediate leaf shape allele, sub-okra, lacks both the promoter duplication and the exonic deletion. Our results indicate that sub-okra is the ancestral leaf shape of tetraploid cotton and normal is a derived mutant allele that came to predominate and define the leaf shape of cultivated cotton. Cotton (Gossypium spp.) is the world’s most important source of natural fiber as well as a leading oilseed crop. The cultivated cottons (G. hirsutum and G. barbadense) are allotetraploid species (2n=4x=52, AADD) formed from the hybridization of diploids G. arboreum (2n=2x=26, AA) and G. raimondii (2n=2x=26, DD)1. 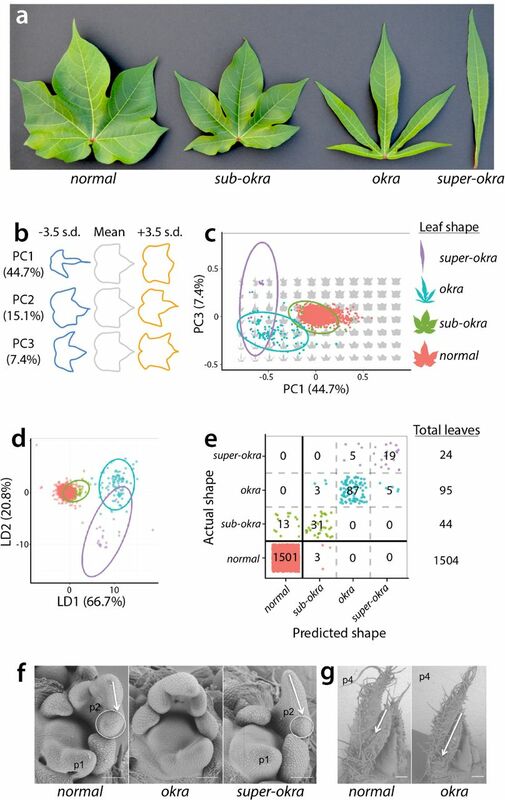 Remarkable phenotypic diversity exists for leaf shape in cotton, widely ranging from entire (lacking dissection) to deeply lobed across both diploids and polyploids2–4. Although the role of leaf shape variation in the evolution and adaptation of Gossypium to diverse environments is not yet clearly established; leaf shape is an important agronomic trait that affects plant and canopy architecture, yield, stress tolerance, and other production attributes5. The four major leaf shapes of cotton: normal, okra, sub-okra and super-okra (Fig. 1a) are semi-dominant and allelomorphic at the L-Dl (okra) locus6–11 while laciniate, similar in morphology to okra, maps to the orthologous diploid A-genome locus (L-Al)12. Morphometric analysis of leaf shapes conferred by the sub-okra, okra, and superokra mutations. (a) Left to right, leaves representative of normal, sub-okra, okra, and superokra leaf shape phenotypes. (b) Eigenleaves representative of leaf shapes found +/− 3.5 standard deviations along each Principal Component (PC) axis calculated from the harmonic series of an Elliptical Fourier Descriptor (EFD) analysis. Percent variance explained by each PC is provided. (c) PC1 and PC3 (PC2 not shown, as it explains asymmetric shape variance) separate normal and various okra leaf shape classes. 95% confidence ellipses provided. (d) Linear Discriminant Analysis (LDA) maximizes the discrimination of normal and okra leaf shape classes. LD1 and LD2 are shown, and the percent separation between phenotypic classes of leaves indicated. 95% confidence ellipses provided. (e) A confusion matrix, showing actual vs. predicted leaf shapes, constructed using linear discriminants. Leaf shape alone discriminants a majority of normal from sub-okra, okra, and super-okra leaf types. (f) Scanning Electron Micrographs (SEMs) of the Shoot Apical Meristem (SAM), P1, and P2 leaf primordia for normal, okra, and super-okra shoot apices. Note the displaced lobe in the P2 of super-okra relative to normal. (g) SEM of normal and okra shoot apices showing a more pronounced leaf lobe present by the P4 stage of leaf primordium development in okra relative to normal. Colors: normal, red; sub-okra, green; okra, blue; super-okra, purple. The okra allelic series confers increasingly lobed leaf shapes from sub-okra to okra with the proximal lobes in mature super-okra reduced to a single linear blade (Fig. 1a). The characteristic shape of these four leaf morphs can be used both qualitatively and quantitatively2,13 to distinguish among their alleles (Fig. 1b-e). Classical development studies involving okra revealed the underlying factor acted early in leaf development in all tissue layers (L1, L2, L3) and cell autonomously2, 14 Scanning Electron Micrographs (SEMs) of the shoot apical meristem show that the deeply lobed phenotype of super-okra is apparent by the P2 stage of leaf development (Fig. 1f), while the less severe okra manifests by the P4 stage (Fig. 1g). The L-Dl locus was placed on the short arm of chromosome 15-D1 (Chr15) using cytogenetics15, 16 and confirmed by QTL mapping17–20. Recently, the L-Dl locus, was localized to a 5.4cM interval near the telomere of Chr1521. Shuttle mapping utilizing the laciniate gene (L-A2l) from G. arboreum further reduced the candidate region to 112kb and ten genes12. Here, we report the identification of a LATE MERISTEM IDENTITYl (GhLMIl-Dlb) gene, encoding an HD-Zip transcription factor, as the major determinant of leaf shape variation at the L-Dl locus in cotton. To determine the quantitative extent that the okra locus is responsible for controlling leaf shape in cultivated cotton, we morphometrically analyzed 1504 leaves from 420 cultivated cotton lines (Supplementary Table 1). The eigenleaves resulting from a Principal Component Analysis (PCA) of the harmonic series of an Elliptical Fourier Descriptors (EFDs) analysis describe shape variance associated with linear vs. palmately-lobed leaf types (PC1) and pronounced distal lobing (PC3), in addition to fluctuating asymmetry (PC2) (Fig. 1b). PC1 and PC3 (in addition to other PCs not shown) separate normal from sub-okra, okra, and super-okra leaf types and explain the majority of shape variance in the cotton accessions analyzed (Fig. 1c). A Linear Discriminant Analysis (LDA) performed to distinguish cotton accessions by leaf shape led to the following correct percentage of assignments to phenotypic class by EFDs alone: 99.8% normal (1501 of 1504 cases); 70.5% sub-okra (31 of 44 cases), 91.6% okra (87 of 95 cases) and 79.2% super-okra (19 of 24 cases) (Fig. 1d, e). The classification became 99% correct (1651 of 1667 cases) if only two classes were formed: normal and non-normal (inclusive of sub-okra, okra, and super-okra) (Fig. 1e). Our results indicate that okra (L-DlO), a monogenic locus, is quantitatively responsible for the majority of leaf shape variance in cotton, the alleles of which can be discriminated from each other at high correct classification rates using shape information alone. A strongly monogenic basis for leaf shape in cotton is in contrast to a polygenic basis for leaf shape described in other crops22,23. Our results are consistent with classical morphometric work describing the profound role the L-D1O locus plays in determining cotton leaf shape2,13. 1,027 F2 plants from the cross NC05AZ21 × NC11-2100 showed the expected phenotypic ratio for single gene inheritance of okra leaf shape (Supplementary Table 2). Genotyping with the co-dominant flanking SSRs of L-Dl (Gh565 and DPL0402) identified 122 recombinants and produced a genetic map (Fig. 2a) similar to the preliminary mapping21. Genotyping of these recombinants showed marker 13-LS-195 continued to co-segregate with leaf shape phenotype, confirming that 13-LS-195 is tightly linked to the leaf shape locus (L-Dl) in cotton21. The resulting 337 kb, 34 gene candidate interval (Fig. 2b)21 was further resolved to 112 kb and ten genes using orthologous mapping of the homeologous laciniate gene12 (Fig. 2c). Genetically resolving the L-Dl locus in Upland cotton. (a) Genetic mapping of L-Dl locus based on bi-parental mapping. (b) Orthologous mapping to the sequenced D genome donor (G. raimondii) chromosome 2 (337kb, 34 putative genes)21. (c) Shuttle mapping utilizing the orthologous laciniate (L-A2) locus from donor diploid G. arboreum (112kb, 10 putative genes)12. (d) Fine mapping combining an association mapping panel and two sets (BC8 and BC3) of isogenic lines (52kb, putative 4 genes). (e) Association analysis statistics, adjusting for population structure for variants within candidate gene region. Novel markers: Using G. raimondii sequence information24, four novel markers were developed within the ten gene candidate region (Supplementary Fig. 1): 1) a large (>100 bp) STS marker (GhLS-STS1) in the promoter region of Gorai.002G244000, 2) an 8-bp STS marker (13-LS-195) within Gorai.002G244000, 3) a C⟶A SNP (GhLS-SNP2) in the intron of Gorai.002G244l00 and 4) a 13-bp STS marker (GhLS-STS2) <300 bp downstream of the Gorai.002G244200 stop codon. An additional SNP marker, (GhLS-SNP1) in the intron of Gorai.002G243800 was also designed despite the fact that this gene had already been excluded by orthologous mapping (Fig. 2c). Association mapping: Of the four markers used to genotype the diversity panel of 538 accessions, three markers (GhLS-STS1, 13-LS-195, and GhLS-SNP2) showed complete association with leaf shape (Supplementary Table 3) while marker GhLS-STS2 showed no association between the two most common leaf shapes, normal and okra (Supplementary Table 3). The lack of association of this STS marker with leaf shape was sufficient to reduce the ten gene, 112-kb candidate region (Fig. 2c) to a four gene, 52 kb region between Gorai.002G243900 and Gorai.002G244200 (Fig. 2d and Supplementary Table 3). Population structure was estimated in a subset of 404 lines of the 544 member panel using SSR markers distributed throughout the genome. Association tests of variants in the candidate gene region and of SSRs throughout the genome confirmed that the four remaining candidate genes showed very strong and significant (p < 10−7) association with leaf shape after correcting for population structure (Fig. 2e and Supplementary Table 4). A few SSR markers also had significant associations, which may have occurred by chance when rare allele classes were observed in okra types (Supplementary Fig. 2a and Supplementary Table 4). After fitting the most significant candidate gene marker as a covariate and retesting the background markers for associations, no markers outside the candidate gene interval were significant (Supplementary Fig. 2b and Supplementary Table 4). Mapping using isogenic lines: We confirmed that genes conferring the okra phenotype in the mapping parent NC05AZ21 and okra isogenic line (LA213-okra) are allelic by phenotyping their F1 (Supplementary Fig. 3) and an F2 population. Genotyping of two sets of isolines (BC8 in Stoneville 213 and BC3 in Stoneville 7A backgrounds) with the four novel markers showed a similar marker pattern as observed in the association mapping (Supplementary Table 3 and Supplementary Table 5), confirming the resolution of the candidate region to four genes and 52 kb. Thus, characterizing the association-mapping panel and isolines with novel markers reduced the candidate genomic region to 52kb containing four genes. Of the four genes, Gorai.002G244200(here after GhLMIl-Dla) and Gorai.002G244000 (here after GhLMIl-Dlb) are paralogues coding for HD-Zip transcription factors with 71.2% protein similarity. Their homologs were implicated in flowering time and leaf complexity in Arabidopsis 25,26,27. Of the remaining two putative genes, Gorai002G244l00 (hereafter GhRLKl), is a serine/threonine protein kinase while Gorai.002G243900 (hereafter GhHRAl) is a trihelix transcription factor. Expression analysis was performed to help identify the causal gene among the four remaining candidates. Semi-quantitative expression analysis revealed that neither GhHRAl nor GhRLKl were expressed in young leaf tissue (Supplementary Fig. 4). Based on this observation together with their lack of sequence polymorphisms from novel STS marker development, we eliminated these two genes from consideration. GhLMIl-Dla was similarly expressed among leaf shapes while GhLMIl-Dlb expression was detected only in okra and super-okra (Supplementary Fig. 4). qRT-PCR confirmed the equivalent expression of GhLMIl-Dla among leaf shapes while GhLMIl-Dlb was upregulated in okra and superokra compared to normal and sub-okra (Fig. 3a, b)․. This indicated that up-regulation and/or ectopic expression of GhLMIl-Dlb in okra and super-okra may be responsible for these leaf shapes. Nucleotide polymorphisms of GhLMIl-Dlb gene and expression analysis of candidate genes using qRT-PCR among different leaf shapes. (a, b) Relative transcript levels of leaf shape candidate genes (GhLMIl-Dla and GhLMIl-Dlb) among isolines at ~90 days after planting. There is no difference in the expression of GhLMIl-Dla among leaf shapes but a significant increase of GhLMIl-Dlb expression in okra and super-okra. Error bars represent the standard deviation of the fold change. (c) Polymorphisms among GhLMIl-Dlb sequences from the four major leaf shapes. The 133bp tandem promoter duplication was found only in okra and super-okra and in parallel with elevated gene expression. The 8bp deletion was found only in normal and causes a frameshift mutation and premature stop codon. All other polymorphisms are SNPs with unknown effect on the gene expression and protein function. Sub-okra is set as the standard to which the other three leaf shapes are compared. To identify DNA polymorphisms among leaf shapes, GhLMIl-Dla and GhLMIl-Dlb were sequenced in 20 varieties (Supplementary Table 6) and comparisons were made relative to sub-okra (Fig. 3c and Supplementary Fig. 5). Sequence analysis of GhLMIl-Dla identified two variants (Supplementary Fig. 5). Variant 1 was found in two normal and all five okra and sub-okra lines. Variant 2 was found in the remaining three normal and all five super-okra lines. The 13-bp InDel (GhLS-STS2), which showed no association with leaf shape in the association analysis (Supplementary Table 3), is placed ~100 bp from the end of the 3’ UTR. This polymorphism lies outside GhLMIl-Dla, the proximity, lack of major polymorphisms, and identical expression among leaf shapes provide evidence against GhLMIl-Dla as the candidate gene underlying L-D1. Sequence analysis of GhLMIl-Dlb identified two prominent polymorphisms among leaf shapes. First, a 133-bp tandem duplication located ~800 bp upstream of the transcription start site was unique to okra and super-okra (Figure 3c) and may explain the altered expression of GhLMIl-Dlb seen earlier (Fig. 3b). The second notable polymorphism was an 8-bp deletion in the 3rd exon of GhLMIl-Dlb found only in normal (Fig. 3c). The exonic location of this deletion was confirmed through Sanger sequencing of GhLMIl-Dlb okra cDNA. Translation of the resulting normal coding sequence produces a frameshift 156 amino acids (aa) into the protein and a premature stop codon truncating the protein from 228 aa to 178 aa (Fig. 5a). Neither of the conserved functional domains of an HD-Zip transcription factor appear directly impacted by the deletion. However, the frameshift introduces multiple leucines that may disturb the characteristic spacing of the leucine zipper and alter protein-protein interactions (Fig. 5a). Both major polymorphisms (GhLS-STS1 for promoter duplication and 13-LS-195 for 3rd exon InDel) were completely associated with leaf shape in the association panel and isogenic lines (Supplementary Table3 and 5). Taken together with the gene expression differences, these results provided strong evidence that modifications to GhLMIl-Dlb are responsible for the various leaf shapes of cotton. As expression analysis indicated the elevated or ectopic expression of GhLMI1-D1b could be responsible for okra leaf shape (Fig. 3b), we hypothesized that silencing of GhLMI1-D1b in okra would reduce transcript levels and confer a simpler leaf shape. A 461bp fragment of GhLMI1-D1bOkra encompassing 268bp of the coding sequence (CDS) and 193bp of the 3’ untranslated region (UTR) was used in VIGS. Including the 3’ UTR sequence was expected to minimize off-target silencing of other GhLMI1-like genes, especially GhLMI1-D1a. Silencing of GhLMI1-D1b in an okra isoline led to a pronounced reduction in leaf lobing compared with uninfected and negative controls and a brief period of normal leaf production (Fig. 4a and Supplementary Fig. 6). Silencing of GhLMI1-D1b was eventually overcome, leading to a reversion to okra in a timeframe similar to the loss of silencing seen in the TRV: CHLI positive control (Supplementary Fig. 6). Functional characterization of GhLMI1-D1b using virus-induced gene silencing (VIGS). (a) Representative 6th true leaf and 4 week old plants from VIGS experiment showing the reversion to normal leaf shape in the GhLMI1-D1b silencing treatment. (b) Relative transcript levels of candidate genes in the GhLMI1-D1b silenced and control LA213-Okra plants confirmed the effective knockdown of GhLMI1-D1b. (c) Transcript levels of GhLMI1-D1a were unaffected by VIGS treatment, confirming silencing was specific to GhLMI1-D1b. The level of GhLMI1-D1b transcript was substantially reduced in the TRV: GhLMI1-D1b treatment compared to the negative controls (Fig. 4b). This proved that knocking down the GhLMI1-D1b transcript through VIGS was sufficient to induce normal leaf formation in an okra variety. Furthermore, expression of GhLMI1-D1a was unaffected by VIGS (Fig. 4c) demonstrating specificity to GhLMI1-D1b. Thus, phenotyping and transcript profiling of TRV: GhLMI1-D1b leaves confirmed that altered expression of GhLMI1-D1b was responsible for the Okra leaf shape of cotton. Outside of the promoter duplication sub-okra, okra, and super-okra GhLMI1-D1b were identical except for one promoter SNP unique to both okra and super-okra (Fig. 3c). Phylogenetic analysis confirmed the close sequence relatedness of the sub-okra, okra, and super-okra GhLMI1-D1b alleles (Fig. 5b). However, normal GhLMI1-D1b was considerably different from the other alleles with six unique promoter SNPs and two SNPs in the second exon, both of which cause amino acid changes. Normal also carries a 1bp deletion in the 3rd exon, an additional third exon SNP, and a SNP in the 3’ region (Fig. 3c). Functional prediction and phylogenetic analysis of LMI1-like genes among different cotton leaf shapes. (a) Amino acid translations in the Gossypium LMI1-D1b alleles. 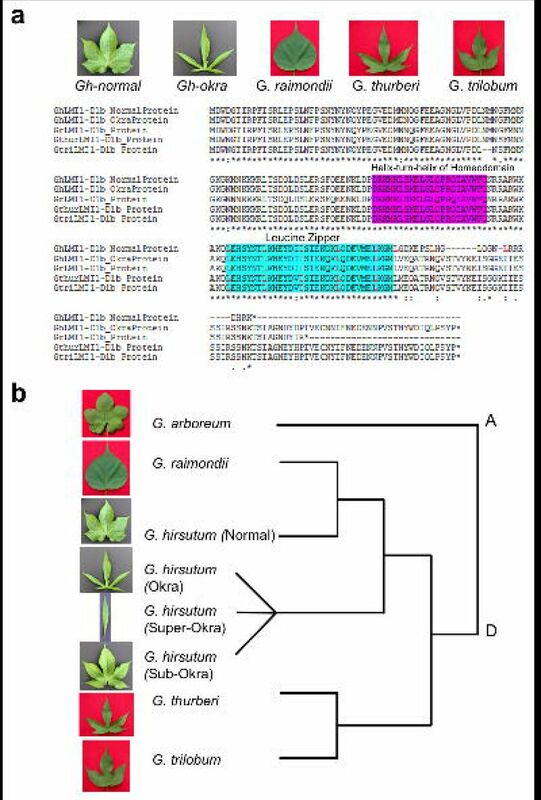 Normal in G. hirsutum and simple leaf in G. raimondii show truncated proteins while G. hirsutum-okra, G. trilobum and G. thurbeii with dissected leaves code for functional LMI1-D1b protein. Frameshift mutation resulting from 8bp deletion in normal introduces additional leucines (L) at 7 amino acid intervals (highlighted in red) that may interfere with the functionality of this domain. (b) Phylogenetic analysis showing the close relationship between okra, sub-okra, and super-okra but not to G. thurberi or G. trilobum. Conversely, normal CDS appears more closely related G. raimondii. The 1-bp deletion would also cause a frameshift and premature stop codon if not for the preceding 8-bp deletion. Interestingly, this 1-bp deletion is identical to one carried by the D genome donor G. raimondii in Gorai.002G244000. While it is unclear if the 1-bp deletion in Gorai.002G244000 plays any role in the entire leaf shape of G. raimondii (Fig. 5a) it would be interesting to determine the leaf shape of a tetraploid carrying just the 1-bp deletion without the preceding 8-bp deletion. Normal leaf GhLMI1-D1b also shares many of its other polymorphisms with Gorai.002G244000 including four out of the six promoter SNPs, the G⟶ A SNP in the 2nd exon, the T⟶ A SNP in the third exon, and the 3’ UTR SNP. Phylogenetic analysis shows that normal leaf GhLMI1-D1b CDS is more closely related to the G. raimondii LMI1-D1b gene than to the alleles in other tetraploids with variable leaf shapes (Fig. 5b). GaLMI1-A1b from moderately lobed G. aboreum is predicted to produce a full-length LMI1-like protein that is identical in length to those produced by the non-normal leaf shapes of tetraploid cotton. In order to further assess the variability of LMI1-D1b genes in Gossypium, GhLMI1-D1b was Sanger sequenced in two additional D genome diploids, G. thurberi and G. trilobum. Both of these species have highly lobed leaves similar to G. hirsutum okra (Fig. 5a). Both of the G. thurberi and G. trilobum LMI1-D1b genes were full-length and similar to those found in the G. hirsutum leaf shape mutants and G. arboreum. Thus, while only a handful of species from the large Gossypium genus have been analyzed, there exists a trend that species with lobed leaves carry full-length LMI1-D1b genes while those with entire leaves produce truncated LMIl-lb genes (Fig. 5a). Extending beyond G. hirsutum, this provides evidence for a broad role of LMIl-lb genes in controlling the diversity of leaf shapes seen throughout Gossypium. The morphological effects of okra leaf shape are evident by the P4 leaf primordia stage (Fig. 1g). To analyze gene expression changes preceding observable changes in leaf morphology, we used RNA-Seq to determine transcriptional changes at the P2 stage of leaf development (Fig. 6a). 453 genes are differentially expressed between okra and normalBC8 isolines (Fig. 6b and Supplementary Table 7). GO enrichment analysis for genes down regulated in okra indicated an association with microtubule and kinesin processes, suggesting a cellular basis for the observed changes in leaf morphology (Supplementary Table 8). The most GO terms for genes up regulated in okra relative to normal are related to photosynthesis (Supplementary Table 9). Previous transcriptomic analyses in tomato apices revealed photosynthetic-related gene expression and genetic changes in leaf complexity are positively correlated23. The direction of this correlation is the same in okra (i.e., positively correlated with more dissected leaf morphology) implying possible connections between leaf development and generation of capacity for photosynthesis. Transcriptomic comparison of okra versus normalP2 stage primordia. (a) SEMs of normal and okra shoot apices. P2 stage leaf primordia (highlighted in green) were hand dissected and processed for Illumina RNA-sequencing. 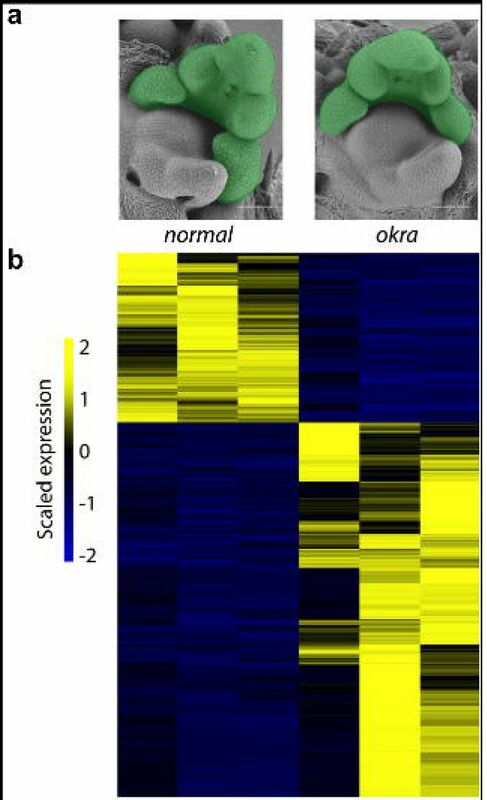 b) Heatmap visualization of the 453 genes that are significantly differentially expressed (false discovery rate ≤ 0.05) between normal and okra P2 samples (Supplementary Table 7-9). Scaled and centered reads per million values for normal and okra biological replicates are plotted in the left three columns and right three columns, respectively. Yellow indicates up regulated and blue indicates down regulated expression values. Scale bars = 100 micrometers. Transient expression of 35S::GhLMIl-DlbOkra-GFP and pUBQl0::GhLMIl-DlbOkra-GFP in Nicotiana benthamiana was used to determine the subcellular localization of GhLMIL-DlbOkra. GhLMIl-DlbOkra-GFPwas detected in the nucleus of transformed tobacco plants (Supplementary Fig. 7) in a pattern that co-localized with the nuclear marker RFP-Histone2B (Supplementary Fig. 7). The nuclear localization of GhLMI1-D1bOkra-GFP is consistent with the predicted function of LMI1-like genes as transcription factors25–27. Leaf shape varies dramatically across plant evolution and in response to the environment. Understanding the genetic architecture of leaf shape is critical for harnessing its variation to modify plant physiology and improve agronomic profitability28, 29. Using a diverse array of genomic and molecular tools, we established that the multi-allelic, major leaf shape locus L-Dl of cotton is governed by GhLMIl-Dlb encoding an HD-Zip transcription factor. LMIl-like genes, in particular their duplication and regulatory diversification, have recently been proposed as evolutionary hotspots for leaf shape diversity in model plants25, 26. The evidence presented here indicates that the major leaf shapes of cultivated cotton are controlled by the same pathway. 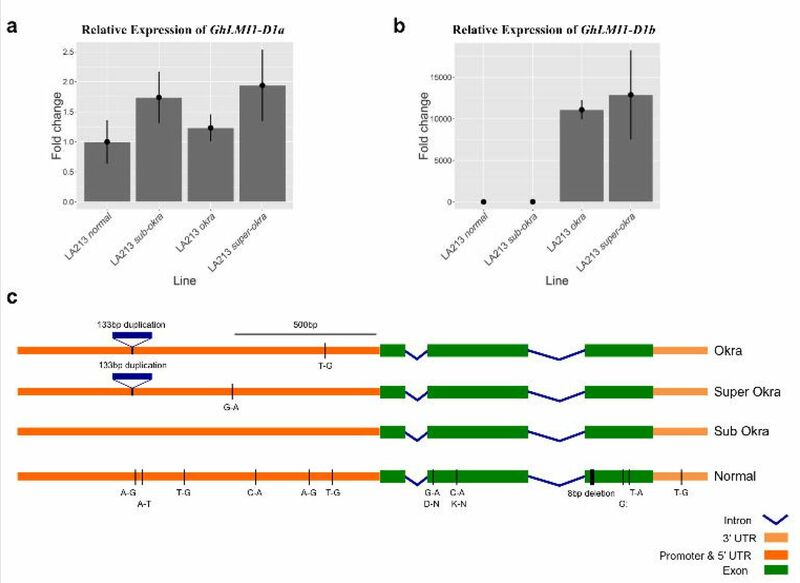 The near-tandem duplication of LMIl-like genes in Gossypium (Fig. 2d) are unique from those previously described, as the Malvales and Brassicales diverged prior to duplications observed in the Brassicaceae26,27. Therefore, the separate LMIl-like duplication event in Gossypium indicates convergent evolution and strengthens the evidence that LMIl-like genes are evolutionary hot spots for modifying leaf shape26,27. Sequence analyses of GhLMIl-Dlb in a set of twenty cultivars elucidated two major polymorphisms among different leaf shapes at the L-Dl locus (Fig. 3c and Supplementary Table 5, 6). First, an 8-bp deletion near the beginning of the third exon was found only in normal GhLMIl-Dlb. This deletion results in a frameshift and premature stop codon in the predicted normal GhLMIl-Dlb protein that may interfere with the function of the leucine zipper motif (Fig. 5a). Additionally, the C-terminal truncation may impact protein stability by removing residues necessary for proper folding. The second co-segregating polymorphism was a 133bp tandem duplication ~800bp upstream of the GhLMIl-Dlb transcription start site (Fig. 3c and Supplementary Table 5). This duplication was present in all super-okra and okra alleles but absent from all normal and sub-okra alleles. Furthermore, expression of GhLMI1-D1b was upregulated in plants with okra and super-okra leaf shapes (Fig. 3b). 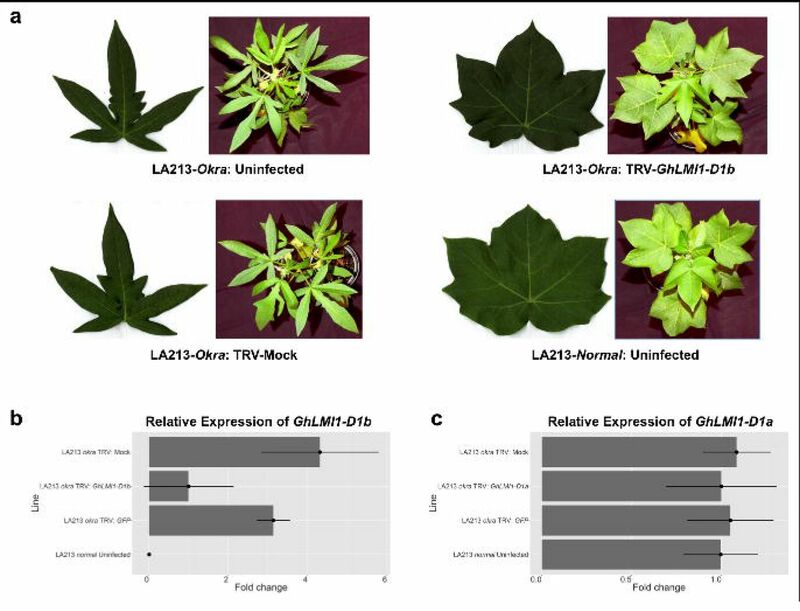 This finding is consistent with previous reports that promoter modifications to LMI1-like genes alter expression and leaf shape in model plants26, 27 Finally, the down-regulation of GhLMI1-D1b by VIGS in a cotton accession with the okra leaf phenotype strongly reduced leaf lobing and resulted in the production of normal leaves (Fig. 4a). Based on phylogenetic analysis, it appears that normal originated in G. raimondii LMI1-D1b (Fig. 5b). Owing to their shared 1-bp deletion, frameshift, and premature stop codon, this protein may already have been non-or partially functional. The subsequent 8-bp deletion, which causes an earlier frameshift and premature stop codon, would be expected to even further compromise the protein function. Sequence analysis indicated the other three leaf shape alleles are not derivatives of G. raimondii LMI1-D1b. This ancestral allele may have derived from a lobed D genome diploid, although likely not G. thurberi or G. trilobum (Fig. 5b). Once the sub-okra allele developed within the D genome, it likely gave rise to okra via a single duplication of 133bp in the promoter region. The origin of this promoter duplication is currently unclear but it may have arisen via unequal crossing over or gene conversion. Consistent with the expression results and gene silencing results obtained here, this promoter duplication led to ectopic and/or over-expression of GhLMI1-D1b and an increase in the degree of leaf lobing and complexity. 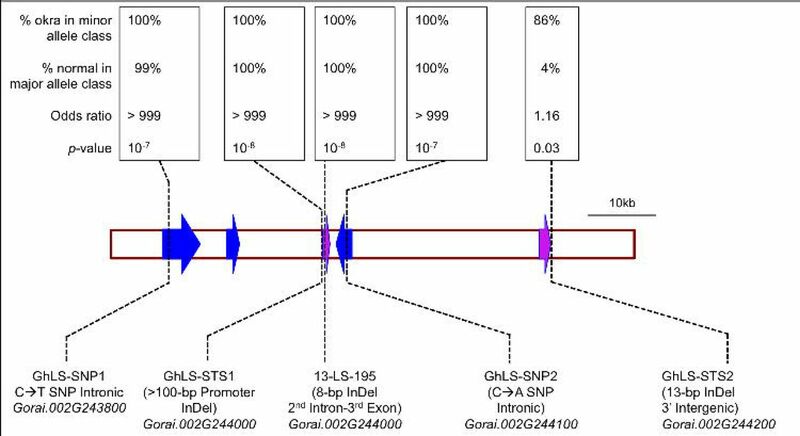 The finding of only a single additional promoter SNP in the entire GhLMI1-D1b genic region between sub-okra and okra indicates this event happened relatively recently. Only two promoter SNPs differentiate super-okra from okra (Fig. 3c) consistent with the knowledge that super-okra originated from okra within the last 90 years8. Phylogenetic analysis involving sequences from all Gossypium species would establish the evolution and adaptive significance of LMI1 genes in cotton. Okra is an exceptional mutation affecting leaf development. It inspired an early quantitative framework for leaf shape across evolution and development2, 13 and through chimeric studies, revealed some of the first insights into the morphogenetic and cellular basis of leaf morphology14, 30. In two separate instances within the Brassicaceae, the homologs of GhLMI1-D1b have been implicated in evolutionary shifts in leaf morphology 26, 27. That the okra locus confers a monogenic basis to most of the leaf shape variance in cotton, the mechanisms for which have been studied in other model organisms, and that it is implicated in the productivity of a major crop, demonstrates a unique intersection between agriculture and the evolutionary and developmental basis of leaf morphology. Clustal Omega Multiple Sequence Alignment, http://www.ebi.ac.uk/Tools/msa/; G. raimondii genome, http://www.phytozome.net; mRNA Translation to Protein Sequence, http://web.expasy.org/translate/; FancyGene http://bio.ieo.eu/fancygene/; Helix-turn-helix Prediction, https://npsa-prabi.ibcp.fr/cgi-bin/primanalhth.pl; Leucine Zipper Prediction, http://2zip.molgen.mpg.de/; Cotton Database, http://www.cottongen.org; https://gtac.wustl.edu/; Sequence Alignment, http://samtools.sourceforge.net; Read mapping http://bedtools.readthedocs.org/en/latest/content/tools/multicov.html; Pairwise gene comparision https://bioconductor.org/packages/3.0/bioc/html/edgeR.html. Methods and any associated references are available in the online version of the paper. VK, RA and DC designed the research and wrote the manuscript, with contributions and final review by the other authors. RA and VK performed fine mapping, gene cloning and functional genomic analyses. VC, MF and DC performed morphometric, SEM and RNA-Seq analyses. LFS and JBH performed association analyses. LZ, BK, HF genotyped the diversity panel. RA, JRT, CHH and VK performed VIGS experiments. MRP and SWH performed the tobacco transient expression assay. Cotton Incorporated supported this work through its corefunding and PhD Fellowship program. For additional support of this research, we thank the NC Cotton Growers Association Inc. and the National Science Foundation: grants IOS-1238014 and IOS-1025947 supported the work of LFS and JRT, respectively. We appreciate the technical help by Jared Smith and Sharon Williamson USDA-ARS and Cathy Herring of NCDA. We appreciate Drs. Richard Percy and James Frelichowski of the USDA-NCGC for supplying the cotton germplasm. Wendel, J.F., Brubaker, C., Alvarez, I., Cronn, R., Stewart, J.M. Evolution and natural history of the cotton genus. In: Genetics and Genomics of Cotton A.H. Paterson (ed.) 3–19 (2009). Hammond, D. The expression of genes for leaf shape in Gossypium hirsutum L. and Gossypium arboreum L. I. The expression of gene for leaf shape in Gossypium hirsutum L. Am. J. Bot. 28, 124–137 (1941). Hutchinson, J.B., Silow, R.A., Stephens S.G., Evolution of Gossypium: Oxford Univ. Press, London. (1947). Saunders, J.H. The wild species of Gossypium. Oxfor Univ. Press, London (1961). Andres, R.J., Bowman, D.T., Kuraparthy, V. Agronomic effects of major leaf shapes in cotton production J. Cot:. Sci. Submitted (2016). Shoemaker, D.N. A study of leaf characters in cotton hybrids. J. Hered. 5, 116–119 (1909). McClendon, C.A. Mendelian inheritance in cotton hybrids. Geo. Agr. Exp. St. Bull. 99, 139–228 (1912). Harland, S.C. The genetics of Gossypium. Bibliographica Genetica 9, 107–182 (1932). Hutchinson, J.B., Silow, R.A. Gene symbols for use in cotton genetics. J. Hered. 30, 461–464 (1939). Stephens, S.G. A genetic survey of leaf shape in new world cottons – a problem in critical identification of alleles. J. Genet. 46, 313–330 (1945). Green, J.M., Sub-okra,a new leaf shape in Upland cotton. J. Hered. 44, 229–232 (1953). Kaur, B., Andres, R.J., Kuraparthy, V. Major leaf shape genes, laciniate in diploid cotton and okra in polyploid Upland cotton, map to an orthologous genomic region. Crop Sci. 56, 1–11 (2016). Hammond, D. The expression of genes for leaf shape in Gossypium hirsutum L. and Gossypium arboreum L. II. The expression of gene for leaf shape in Gossypium arboreum L. Am. J Bot. 28, 138–150 (1941). Dolan, L., Poethig, R.S. Genetic analysis of leaf development in cotton. Dev. Suppl. 1, 39–46 (1991). Endrizzi, J.E., Brown, M.S. Identification of monosomes for six chromosomes in Gossypium hirsutum. Am. J. Bot. 51, 117–120 (1964). Endrizzi, J.E., Kohel, R.J. Use of telosomes in mapping three chromosomes in cotton. Genetics 54, 535–550 (1966). Jiang, C., Wright, R.J., Woo, S.S., DelMonte, T.A., Paterson, A.H. QTL analysis of leaf morphology in tetraploid Gossypium (cotton). Theor. Appl. Genet. 100, 409–418 (2000). Song, X.L., Guo, W.Z., Han, Z.G., Zhang, T.Z. Quantitative trait loci mapping of leaf morphological traits and chlorophyll content in cultivated tetraploid cotton. J. Integr. Plant Biol. 47, 1382–1390 (2005). Lacape, J.M. et al. Mapping QTLs for traits related to phenology, morphology, and yield components in an inter-specific Gossypium hirsutum x G. barbadense cotton RTL population. Field Crop Res. 144, 256–267 (2013). Zhu, Q.H., Spriggs, A., Taylor, J.M., Llewellyn, D., Wilson, I. Transcriptome and complexity-reduced, DNA-based identification of intraspecies single-nucleotide polymorphisms in the polyploid Gossypium hirsutum L. Genes,Genomes, Genetics 4, 18931905 (2014). 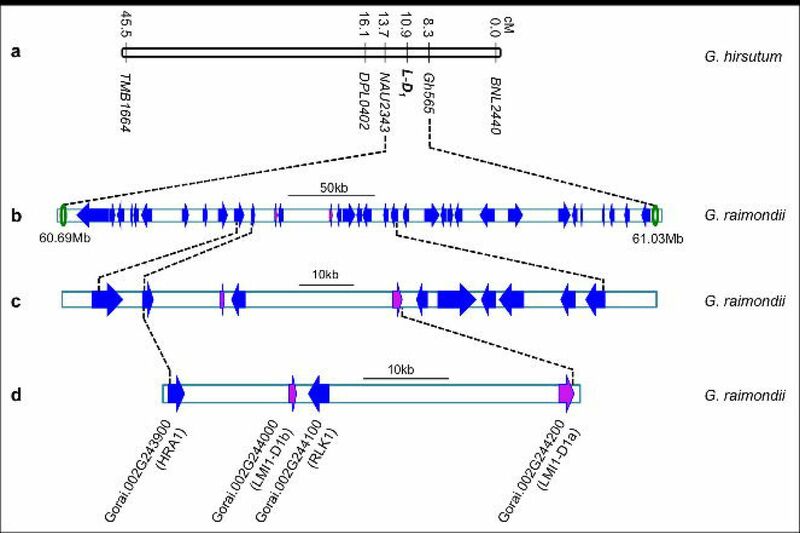 Andres, R.J., Bowman, D.T., Kaur, B., Kuraparthy, V. Mapping and genomic targeting of the major leaf shape gene (L) in Upland cotton (GossypiumhirsutumL.). Theor. Appl. Genet. 127, 167–177 (2014). Tian F., et al. Genome-wide association study of leaf architecture in the maize nested association mapping population. Nat. Genet. 43, 159–162 (2011). Chitwood, D.H. et al. A quantitative genetic basis for leaf morphology in a set of precisely defined tomato introgression lines. Plant Cell 25, 2465–2481 (2013). Paterson, A.H. et al. Repeated polyploidization of Gossypium genomes and the evolution of spinnable fibers. Nature 492, 423–427 (2012). Saddic, L.A. et al. The LEAFY target LMI1 is a meristem identity regulator and acts together with LEAFY to regulate expression of CAULIFLOWER. Development 133, 16731682 (2006). Vlad, D. et al. Leaf shape evolution through duplication, regulatory diversification, and loss of a homeobox gene. Science 343, 780–783 (2014). Sicard, A. et al. Repeated evolutionary changes of leaf morphology caused by a mutation to a homeobox gene. Curr. Biol. 24, 1880–1886 (2014). Nicotra, A.B., Leigh, A., Boyce, C.K., Jones, C.S., Niklas, K.J., Royer, D.L., Tsukaya, H. The evolution and functional significance of leaf shape in the angiosperms. Functional Plant Biol. 38, 535–552 (2011). Chitwood, D.H., Sinha, N.R. Evolutionary and environmental forces sculpting leaf development. Curr. Biol. 26, R297–R306 (2016). Dolan L., Poethig, S.R. The OKRA leaf shape mutation in cotton is active in all cell layers of the leaf. Am. J. Bot. 85, 322–327 (1998).